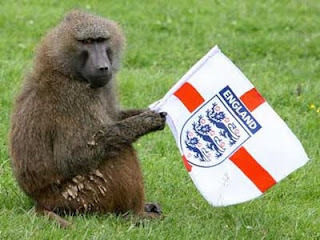 A minor hiccup away to Ukraine apart (doesn't really count - nobody saw it), England have successfully negotiated their way to South Africa for the 2010 World Cup. Scotland, as we are so painfully aware, will not be joining them. So what can we look forward to now? Wall to wall coverage in the "British" media? Pundits predicting the first real chance at glory in over 40 years? John Terry's "feeling" that this England side can do something great getting stronger and stronger? All of the above and more. The jingoistic nonsense of the tabloids and some supporters (conveniently ignoring the Italian gaffer and the European influence at every one of the player's clubs), the never ending references to 1966 and all that, the obsessive stalking of the Wags. We will see it all. Fabio Capello would prefer that we didn't see any of it. As a football man he knows that the English press and their incessant desire to stoke English expectation has been as much to blame for their recent failures as any massive technical deficiency. There are weaknesses in the team, some of them glaring. But there are also outstanding talents and, with Capello jutting his jaw in defiance, unlikely to be the distractions that were allowed under Sven-Goran Eriksson. And what are we left with here? Bitterness and carping is the default position. Supporting anybody but England and wasting money buying the gaudy shirts of their opponents. Politicians making cack handed attempts to ride popular opinion and succeeding only in embarrassing the nation they claim to represent. Can it be different next summer. Please. As we look ahead to 2010 can we not just ignore the press and the commentators, the players and the popstar partners? It's getting tired this obsessive anti Englishness every two or four years. We're supposed to be on the verge of having a mature debate about the very notion of our statehood. Yet when England play Trinidad and Tobago we somehow build it into a bizarre restaging of Culloden. It makes us look a bit silly, a bit simple even. Some of it is just a laugh and that's fine. Healthy even. But some it is shot through with real bitterness as if the 11 men that Capello puts out on the park are to blame for the poll tax, the Battle of Falkirk and everything in between. I'm not saying wish them well. I don't actually really care how they do. But, however much we dress it up, our ostentatious displays of not supporting them are as small minded and silly as the headlines in the English tabloids. We shouldn't be bitter that England are in South Africa. We should be angry that Scotland aren't there. It's been a long time since 1998. Too long. If we want to be pissed off let's be pissed off at that. There's no point standing flinging bricks at your neighbour's windows if your own walls are crumbling. I agree with everything you have said. Its strange this, i generally support English teams in Europe (not Man U) and always wish them well but i can never find myself supporting the English national team. I put this down to 2 reasons. 1.. Its the biased commentary that puts many people off and when your a Scot watching a England game i object to the "we" part in the comentary. I know its silly but would the English put up with them being called "we" if they were watching a Scotland match ? So in short its the media that is at fault. 2..This reason is more personal. Just up until the summer this year i played for Scotland in the British Universities soccer championships (Busa) 4 times and for the second year in a row we were beaten by England in the final, you could say im clutching at straws lol but i do like to have a reason. Och its just the wee country big country syndrome and they did and we didny. I do however have to add that the magnificent Heriot Watt won the Scottish BUSA shield 5 times in a row and i was in the team in 3 of the years although we lost it this season to Stirling. Except the red top's would rather play to the Old Firm and their supporters than really talk about why Scottish Football is so obviously failing. By the way, i don't really mind the English national football team, its more the media which gets on my goat. I suspect that this is for another blog though.